Welcome to LBM Advantage’s 2019 Annual Convention & Shareholders Meeting! and participation over the years. This year we return to the Rosen Center in Orlando. We expect record attendance with over 600 member attendees and staff, and 250-275 key product vendors, distributors and manufacturers. Executive Vice President Tom Molloy and the entire Building Products team are working aggressively and innovatively with key vendors to offer exclusive show specials to our member attendees. Every year this event gives us a chance to meet with dealers and vendors to discuss programs and opportunities for the coming year, as well as create an exclusive buying event. This year there will be more educational and informational seminars; including opportunity for our Next Generation (NextGen) members to continue their program. There will also be an opportunity to meet with the board of directors in a booth on the show floor. 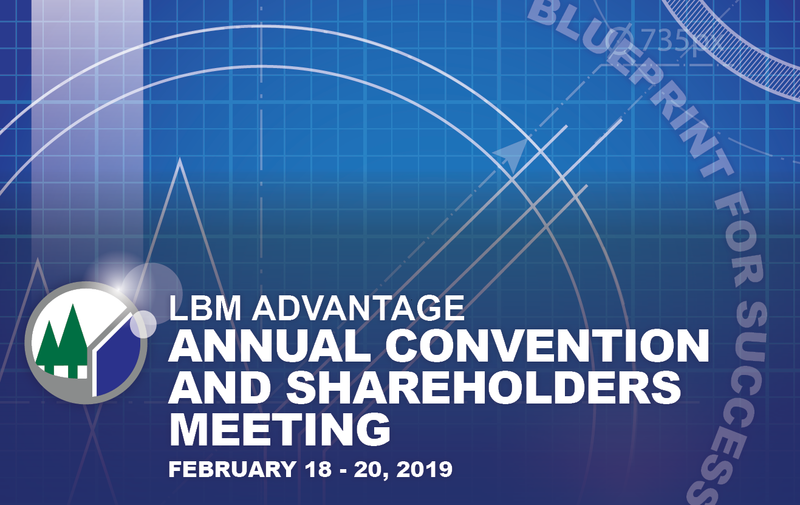 In addition, and as always, the LBM Advantage Board of Directors will host our annual Shareholders Meeting. new and old, from the three legacy coops of PAL, ENAP and IBSA. There will be staff and vendor representation from all regions. Thank you for a great 2018 and for your support of LBM Advantage. We are looking forward to another year of assisting our membership in their successes and profitable growth.